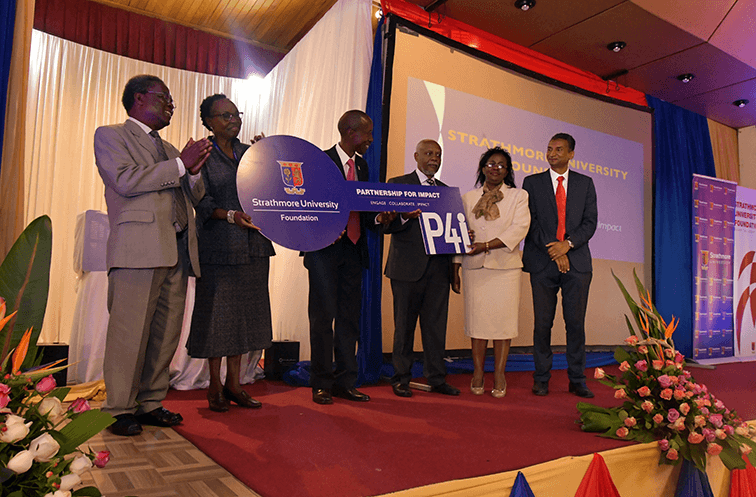 The Strathmore University Foundation (SUF) was officially launched in a ceremony that was attended by the university council, staff, students, sponsors and partners that have contributed to the growth witnessed in the last 58 years. Speakers at the event included Mucai Kunyiha, Managing Director, Cooper Kenya Ltd, and Director, Acorn Group Limited, Zephaniah Gitau Mbugua, Founder and Chief Executive Officer at Abcon Group of Companies and an alumnus of Strathmore College and Strathmore University Business School, and Margaret Osure, member of the University Council and chair of the fundraising and external relations committee. The journey to this occasion began with the launch of the 2015-2025 University Strategic Plan when the University leadership established SUF to spearhead resource mobilization and fundraising initiatives for and on behalf of the university. This was to cope with the rapidly changing internal and external environment in the fundraising sphere, demand for services necessitated by the rapid growth of the University and the need for major development projects. From its early days as a college offering Advanced-level Sixth Form subjects in Science and Arts, to being a fully-fledged University receiving its charter in 2008, Strathmore University has benefitted immensely from the goodwill of several individuals and organizations. In the last year alone, this goodwill from partners has enabled the university to give over KES 160,000,000 worth of study scholarships to some of the brightest students in need around the country. Moreover, on the research front, the University has been able to create over 15 fully operational research centres within the University. Through the gifts and donations, the university has been able to award scholarships, set up endowment funds, put up state-of-the-art facilities, contribute and enrich the lives of communities in need, develop our members of staff, run continuous research activities and conferences and create research labs. Stefano-Antonio Dejak, the Ambassador of the European Union to Kenya, expressed the desire of the European Union (EU) to have further collaboration with the University. The European Union gave a grant for the construction of the Ole Sangale campus in the early 1990s. “Ensuring quality education is a crucial matter. We will continue to collaborate with Strathmore University. We can seek further collaboration with the university for the benefit of Kenyan citizens.” He also stated that Strathmore University students can apply for EU funded Erasmus scholarships. Effective stewardship of the university resources has also ensured a constant growth in the asset base which stands at six billion. In the year just past, over 994 students gave over 300,000 hours of community service in 101 schools, 72 non-governmental organisations, 41 homes, 22 churches, 19 hospitals and 10 community centers. Macheo, a programme that is run by the Community Service Centre, was highlighted. The life of one of the beneficiaries of the programme, Teresia Nekesa, who was present at the event, was a testimony to the impact that SUF will have on the community. Her leap from studying in Kibera slums to now being a Bachelor of Arts in Communication student gives inspiration to the students enrolled in Macheo. She volunteers with Macheo Mtaani, an initiative for students in Kibera who, though not beneficiaries of Macheo, can reap from what she and others graduates of Macheo have received. This article was written by Anne Njoroge and Wambui Gachari.